KINGMAN – The Arizona Game and Fish Department is seeking information about the recent illegal killing of a fawn mule deer doe near Kingman. 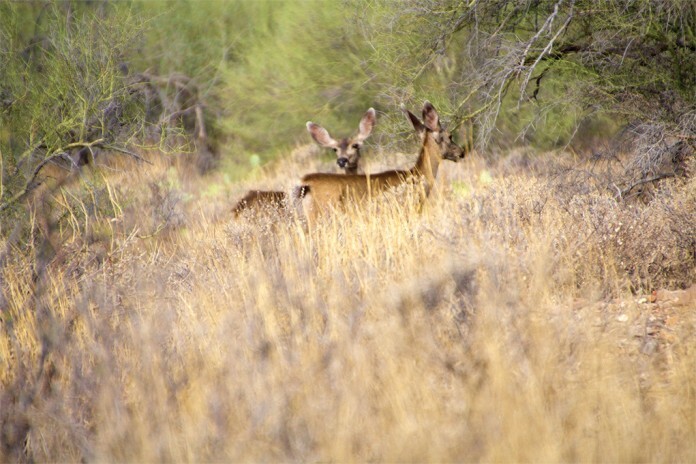 The fawn was found near Twin Hills Road in the Blake Ranch area of the Peacock Mountains located in Game Management Unit 15B. Only the head of the fawn was found at the scene with evidence that it had been removed by someone. The crime is believed to have been committed the night of Dec. 30 or early morning of Dec. 31, 2017. Evidence was collected at the scene, but help from the public will play a critical role in finding those responsible, said Wildlife Manager Cody Johnston. Johnston noted that the hunter community does a good job of policing itself, and most reports of wildlife law violations received through the Operation Game Thief (OGT) hotline are reported by hunters. OGT rewards are paid from the Wildlife Theft Prevention Fund, which is funded largely by criminal fines and civil restitutions from wildlife violators. No reward money comes from the sale of hunting/fishing licenses. Anyone with information is encouraged to call the department’s OGT hotline at (800) 352-0700, or visit https://www.azgfd.com/ogt/, and refer to case #17-005055. Callers may be eligible for a reward up to $500 in this case. Callers identities’ are confidential and can remain anonymous upon request.